We are pleased to inform you that from the 1st January 2018 Sampsistemi incorporates Euroalpha and Alphatech. Sampsistemi and its American subsidiary SAMP USA will exhibit several machines representing the company’s ever-growing product range. SAMP is happy to inform you that, starting from today, we will take care of an awesome blog! We are glad to inform of our participation at the WAI International Technical Conference in Monterrey, October 18-20, 2016. We are glad to announce our participation to the IWCS Conference in Providence, RI, USA (October 02-05, 2016). We are glad to announce our participation to the Wire China show in Shanghai (September 26-29, 2016). 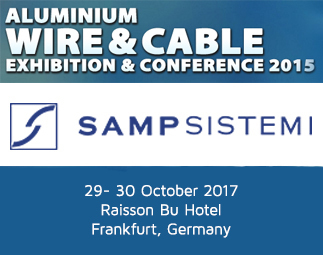 We are glad to be Silver Sponsor of the 10th Annual Wire and Cable Conference (June 20-22, 2016).